In gatherings and professional meetings, people tend to gather around a center point. Most of the times, participants naturally organize themselves around a table and its center is the focal point towards which people can look effortlessly while keeping an eye contact with each other. In the professional world however, and for more than 30 years, people have been gathering facing walls to look at projected content or wall-mounted screens and to run video calls. They have been missing out on the natural experience, the eye contact and much more. Using a Centre of Table (CoT) collaboration system offers many advantages and solves some of the existing challenges when it comes to group collaboration and video conferencing (VC). Some center of table VC solutions in the market place the camera(s) in the center of the table while keeping the content on a wall mounted screen. These solutions address parts of the problem since participants still need to switch between looking at a wall-mounted screen and at the cameras in the center. However, using a true CoT system like the Silex PTE Trio or Silex PTE Quattro where all the components are in the center of the table (cameras, speakerphone, touch screens, whiteboard, presentation system…) has many benefits for both the local participants and those joining over video. In traditional setups, content is usually displayed on a wall-mounted screen installed on one side of the conference table. Thereafter, the selected wall becomes the focal point towards which all the participants direct their attention. Looking off to a side of the room inherently draws the attention away from the natural center point of human discussion — which happens to be the center of the table. With a Silex PTE system, the shared content is displayed on the screens in the center of the table, at the natural center of discussion. In this setup, all participants perfectly see the content from one of the screens while keeping a clear line of sight with the others sitting around the table. Since video calls are placed from the system, the far site is also displayed in the center of the table. Thus, attendees have also the remote participants within their field of view. The Center of Table concept extends the user experience to participants joining in a teleconference meeting. In Silex CoT systems, the cameras are in the center of the table but they are oriented in different directions thus covering all the corners of the room to offer a great panoranic coverage. The participants sitting around the CoT system are captured by the cameras and appear just like being in an Immersive Telepresence space. With a traditional wall mounted VC system, all participants cannot be seated at the same distance from the screen. Some of them would be sitting closer than the others and therefore look bigger than the others on video. In such a setup, the participants sitting on the sides would need to twist their neck for the duration of the video call and the far end participants will find it difficult to identify the speaker and to properly see the facial expressions. With a CoT system, participants are seated at an equal distance from the device so they are well framed by the cameras facing them and they all look the same size on video. Therefore, it is easy for a remote participant to perfectly see the facial expressions of all the people sitting around the CoT system and to easily identify the speaker. The integrated cameras being smartly placed just above each display of the Silex PTE CoT collaboration system, a user looking at the display substantially appears to be looking directly at the camera. The result is a captured video feed in which the attendees using a Silex PTE system appear to be looking in the eyes of attendees in a remote location. The provision of multiple displays oriented in different radial directions ensures that all participants in the same meeting room have a viewing opportunity of the content regardless of their place around the table. Moreover, all screens are touch screens and the system becomes a multi-sided whiteboard sitting right in the center of the table at an arm’s distance from all participants. This allows participants to annotate on any content while remaining seated and captured by the camera facing them. As a result, the far end can see the person annotating while enjoying both the annotations and a continuous eye contact. If participants are looking at a big wall-mounted screen, it doesn’t necessarily mean that they are seeing the content well. Two important factors affect the viewing experience: the size of the screen and the distance from which a person is looking at it. 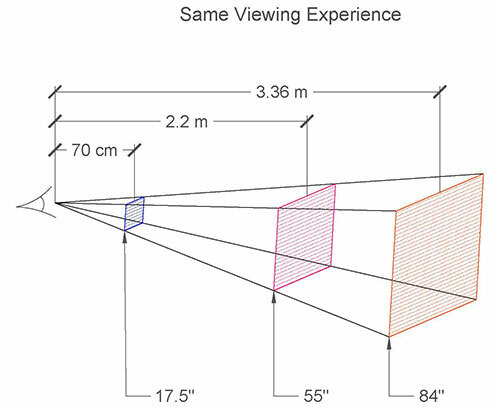 To get the same viewing experience from two different screen sizes, the viewing distance changes based on Thales mathematical theorem, illustrated below. The Silex PTE screens are 17.5” screens and participants would look at one of them from an arm’s distance. This corresponds to 70cm on average. To get the same viewing experience when looking at a wall mounted screen located at around 3.3m away from the viewer, the size of the wall mounted screen should be around 84”. These conditions are not always met in traditional meeting rooms, because either the screen is undersized or because some participants are sitting too far from the screen. When using a Silex PTE CoT system, all participants are seated at an equal distance from the screen and they all enjoy a perfect viewing experience. When designing an office space, some standards have to be taken into consideration. For instance, the minimum space allocated per chair along with the minimum free space to leave behind each chair define the minimum table size required. The Wall mounted screen dimensions define the minimum distance from which participants should be seated to properly place the table (for an HD screen it should be 3 x the height of the screen). Bearing these parameters in mind, with a system sitting in the center of you meeting room table, the required space to fit 8 persons comfortably is smaller than the space you would need if you were in a traditional setup with a wall mounted screen. For instance, if we compare the room space required between a traditional setup using a 75” screen and a CoT setup, we would require 66% less space with the latter. If we do a similar comparison with a traditional setup using a 55” screen, then we would require 30% less space if we were to have a CoT setup instead. A content displayed in the center of the table and easily accessible for annotation.